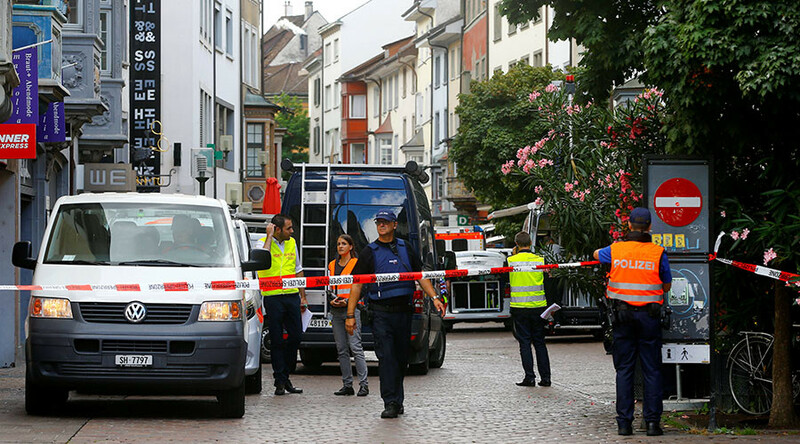 A manhunt is underway in the Swiss town of Schaffhausen after a chainsaw-wielding assailant injured five people, two seriously, in a violent attack. Police say they are not treating the attack as a terrorist incident. Police identified the suspect as Franz Wrousis and confirmed the weapon he used. The suspect is described as dangerous and bald with an “unkempt” appearance. Measuring about 1 meter 90 centimeters (6ft 2in) in height, he’s believed to be driving a white Volkswagen Caddy. The vehicle has now been located by police, reported Tages Anzeiger. Images of the suspect have been released. Die Polizei sucht mit DIESEN Bildern den Angreifer von Schaffhausen! Police say five people are injured. They were alerted to the scene just after 10.30am local time after the suspect entered a CSS health insurance office. Parts of the old town are sealed off due to a "special situation," according to police. Ambulance teams and police are on the scene and rescue helicopters are circling overhead, according to a police spokesperson.